Coming To Chattanooga? Visit the Tennessee Aquarium! HomeComing To Chattanooga? Visit the Tennessee Aquarium! We live just a little over an hour from Chattanooga! I was super stoked when we were given the opportunity to visit the Tennessee Aquarium! I have been once before, however Lydia hasn't! When you visit, you can go to the ticket booth and purchase your tickets. You can choose to go in the River Journey Building first, or the Ocean Journey. It doesn't matter, however when you visit you still have to go in both to see everything. Inside the River Journey building, visitors are delighted by feisty river otters, colorful frogs, amazing turtles and freshwater fish species such as beautiful trout, giant catfish and prehistoric-looking sturgeon. While exploring Ocean Journey, guests come face to face with big, toothy sharks, beautiful butterflies, playful penguins, mesmerizing jellyfish and thousands of colorful reef fish. You will see all kinds of exotic plants and animals! You can check out more about the Exhibits here. My favorite are the different kinds of Jelly Fish! They are so fascinating! The Penguins are SO fascinating as well! They are SUPER cute! 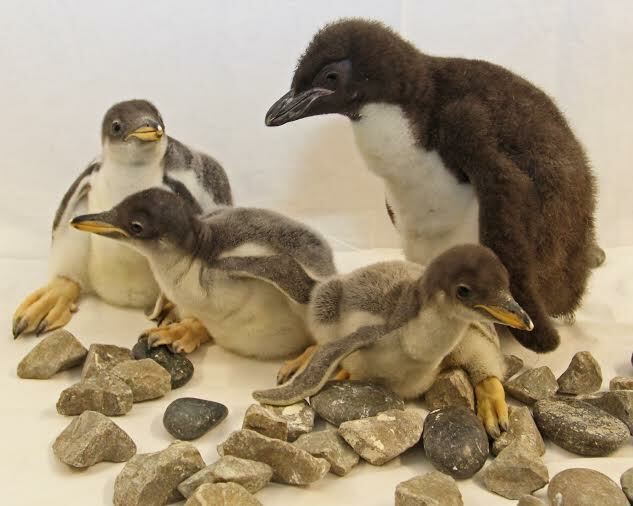 Check this out- There was a Macaroni Penguin that was the first to hatch in 2015, now there are a trio of babies! Our family had such an amazing time at the Tennessee Aquarium! It took about 2 1/2 hours to go through it because we took our sweet time. If you want to visit, Admission is $29.95 per adult and $18.95 per child, ages 3-12. Each ticket purchased helps support Aquarium conservation programs. The IMAX® 3D Theater is next door to the Aquarium. Ticket prices are $9.95 per adult and $8.50 per child. Aquarium/IMAX combo tickets are $35.95 for adults and $24.95 for children. Excursions aboard the new River Gorge Explorer depart daily into “Tennessee’s Grand Canyon.” Cruise tickets are $32.00 per adult and $24.50 per child (3-12). Advance tickets may be purchased online at www.tnaqua.org or by phone at 1-800-262-0695. The Aquarium, located on the banks of the Tennessee River in Chattanooga, is a non-profit organization. Open every day except Thanksgiving and Christmas, the Aquarium and IMAX are accessible to people with disabilities. Visit them on their social media below to stay up to date with the latest! Thanks for reading!! I have never visited since I live so far away, but that is one neat aquarium and I'm glad your family got to enjoy it. I have to agree those jelly fish are very cool! Thanks for sharing the photos if I am ever out that way it looks like one place I'd love to visit. It is astonishing to see all the unique and bizarre creatures that are found in the oceans.